Australia and Turkey have a productive and steadily developing relationship, with substantial dialogue across a wide range of issues, frequent high-level visits and expanding bilateral trade and investment. Formal bilateral relations between Australia and Turkey commenced with the signing of a bilateral agreement on assisted migration in 1967 and exchange of Ambassadors in 1968. A mutual desire to boost trade and investment ties and to strengthen cooperation on issues of international concern has led to the broadening of the relationship since the 1990s. The relationship with Turkey has grown rapidly since 2005 when the former Prime Minister, Mr Howard, and his Turkish counterpart, Mr Erdoğan, exchanged visits. These visits were followed by many high-level visits in both directions. Over the past decade Australia and Turkey have also signed a considerable number of bilateral agreements. As well as an embassy in Ankara and a consulate-general in Istanbul, since 2006 Australia has had a consulate in çanakkale (the province in which Gallipoli is located) to provide consular assistance to the growing number of Australians who visit the Anzac battle sites each year. Both Australia and Turkey regard the 1915 Gallipoli landings as an event of particular significance in their modern histories. Every year a large number of Australian and Turkish citizens attend commemorative services at Gallipoli. Approximately 7,500 Australians attended the 96th Anniversary Commemorative Services in 2011. An agreement on the residence and employment of Turkish citizens in Australia was signed in 1967. An Agreement on Economic Co-operation was signed in 1988. An Extradition Treaty entered into force in 2003. A Work and Holiday Visa Arrangement and a Memorandum of Understanding (MOU) on agricultural cooperation were signed in December 2005. A Defence Framework Agreement was signed in August 2006. In February 2007 Australia and Turkey signed an MOU on counter-terrorism cooperation and organised crime. In September 2008, Australia and Turkey signed an arrangement on cooperation in the fields of animal health and biosecurity. An Investment Promotion and Protection Agreement entered into force in June 2009. A Defence Material Cooperation Arrangement was signed in March 2010. A Double Taxation Agreement and an Air services Agreement were signed in April 2010. The Republic of Turkey was founded on 29 October 1923 by Mustafa Kemal Atatürk, a military hero who participated in the Gallipoli campaign. As its first President – remaining in office until his death in 1938 – Atatürk embarked on a radical modernisation program along Western lines. In the ensuing years Turkey underwent a series of social and political reforms that saw the establishment of a secular, democratic political system. The Turkish political structure continues to reflect Atatürk's secular and pro-Western legacy. Turkey is the only Muslim country to have secularism written into its constitution (99 per cent of the population are Muslims). Turkey's political system is based on a separation of powers. The current President is Abdullah Gül, who was elected by parliament on 28 August 2007. The Republic of Turkey has a unicameral parliament, the Turkish Grand National Assembly (TGNA), with 550 deputies (parliamentarians). Executive power is vested in the Head of Government and a Council of Ministers (Cabinet) that usually numbers around 35. Deputies are elected on a first-past-the-post system for a four-year term. Political parties must achieve a national threshold of 10 per cent of the vote to gain representation in the TGNA. Prime Minister Recep Erdoğan's 'Justice and Development Party' (AKP), established in 2001 and first elected in 2002, was returned to power in 2007 and again in elections on 12 June 2011. The AK Party again increased its primary vote from 47 percent to 50 percent but, due to changing populations and numbers of MPs in electoral zones, its parliamentary majority actually decreased marginally, from 341 to 326 (still a comfortable margin). In its third term the Government is focused on achieving parliamentary consensus to bring about constitutional change, deal with PKK terrorism, and continue its program of reforms in other areas including social issues, civil-military relations, and relations with minorities. While the AKP declares itself not to be a religiously-based party, it attracts considerable support from the conservative, non-secular elements of Turkish society, which has led its critics to claim it has an Islamist agenda. This perception has created an uneasy, sometimes tense, relationship with the military and the judiciary, both of which are staunchly secular. The separatist Kurdish Workers' Party (PKK) has announced sporadic ceasefires in its 15-year insurgency, including after its leader, Abdullah Oçalan, was captured in February 1999. The PKK nevertheless continues to carry out terrorist attacks within Turkey and there are periodic clashes between the PKK and the Turkish military in the east of the country. Traditionally, Turkey's foreign relations have been structured around pro-Western alliances, its geo-strategic position and cultural and historical ties. The United States is a key foreign policy and security partner for Turkey. Turkey's links with NATO are similarly important. Turkey has seen a particular role for itself in promoting East-West links supporting an 'Alliance of Civilizations' initiative in the UN with Spain. Turkey maintains close relations with a number of European countries, including the UK and Germany, where a significant expatriate Turkish population resides. Turkey's foreign policy has a strong focus on its region. It is committed to play a role in decreasing tensions and rebuilding political and economic stability in the region, particularly following popular 'Arab Spring' uprisings in Tunisia, Egypt and Libya. Like others, it is urging Syria to allow its people to express and pursue their political aspirations. It has good relations with Iran and is committed to working for a solution to address international concerns about Iran's nuclear program. It has similarly good relations with Iraq, and conducts direct discussion with Kurdish authorities in northern Iraq. The deaths of Turkish citizens in the Gaza aid flotilla incident in May 2010 has caused a rift in its hitherto good relations with Israel. Turkey has a close historical relationship with Afghanistan and has twice led NATO's International Security Assistance Force (ISAF) in Afghanistan. It has 1,840 troops in Afghanistan and leads Provincial Reconstruction Teams (PRT) in Wardak and Jawjan provinces. Turkey is committed to encouraging the governments of Afghanistan and Pakistan to cooperate more closely and sponsors a regular trilateral dialogue process with them. The Turkish Government also deployed maritime and ground forces to the UNIFIL deployment in southern Lebanon in 2006, and contributed police to UN missions in East Timor. Turkey regards Cyprus as an important national security issue and maintains a military presence in northern Cyprus. Turkey is supportive of the efforts of the UN Secretary-General to bring about a negotiated and peaceful settlement to the dispute in Cyprus. A further foreign policy focus for Turkey is its complex relationship with neighbouring Greece. 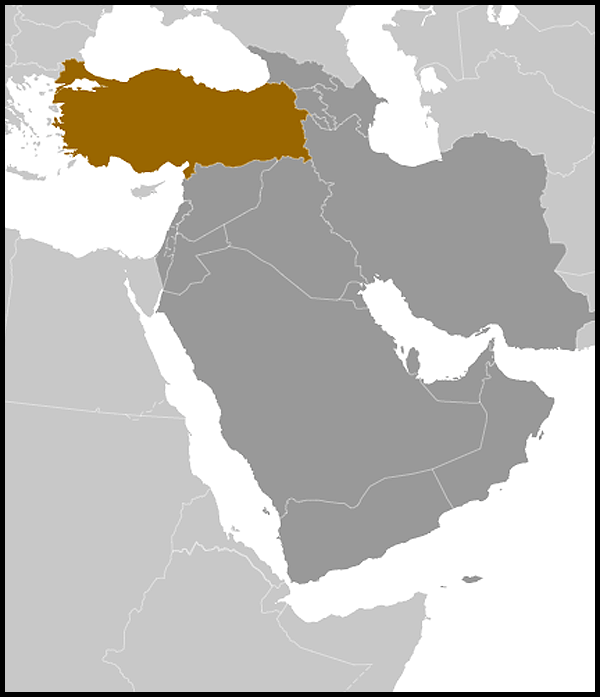 Issues include the divided island of Cyprus, disputed territorial claims in the Aegean, the extent of the continental shelf (Turkey has declined to sign the Law of the Sea Convention), the treatment of ethnic Turks in Greece, and issues relating to Turkish laws governing religious minorities. Turkey maintains strong relations with Russia, Georgia, Bulgaria and other Black Sea countries and is a leader in the Black Sea Economic Cooperation (BSEC) forum. Turkey acts as an important link in the East-West Energy Corridor, bringing the Caspian energy to Europe and world markets. 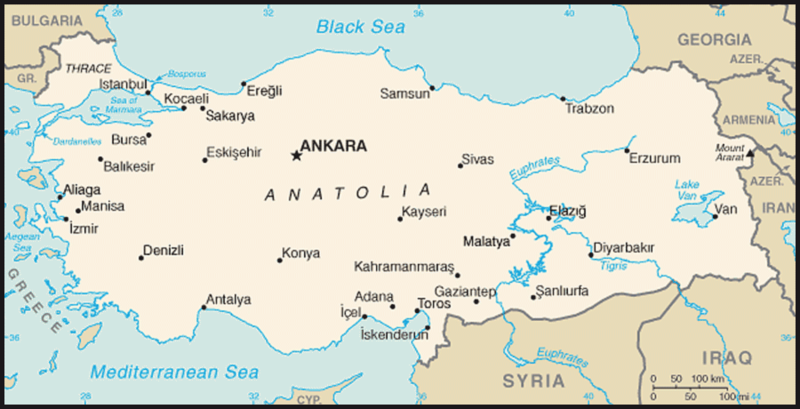 It supported the territorial integrity of Georgia in the 2008 conflict with Russia. It took steps to improve its relations with Armenia, when President Gül made an historic visit to Yerevan in 2008 and in October 2009 Turkey and Armenia signed Protocols that, when ratified by both countries, are intended to lead to the normalisation of relations. Turkey has long sought full entry into the European Union (EU) and achieved a Customs Union with it at the beginning of 1996. In October 2005, six years after declaring it a candidate for membership, the EU opened accession negotiations with Turkey. Eleven chapters have been opened for negotiation so far, and one of them has been provisionally closed. The EU has suspended 18 of the 35 chapters on the agenda for Turkey's accession negotiations, partly due to Turkey's failure to open its ports and airports to the Republic of Cyprus, a necessary requirement to extend Turkey's customs union with the EU to the member states who joined in 2004. Some EU members are opposed to Turkey's membership of the EU, in some cases reflecting EU 'enlargement fatigue'; more recently this has also been mirrored in falling Turkish popular support for EU accession. In 2010 Turkey was the 17th biggest economy globally in terms of its total GDP, and has increasingly been grouped with the rapidly-growing BRIC economies (Brazil, Russia, India, China). It is predicted to be the second-fastest growing economy in the world by 2017, and among the top 10 world economies by 2050. 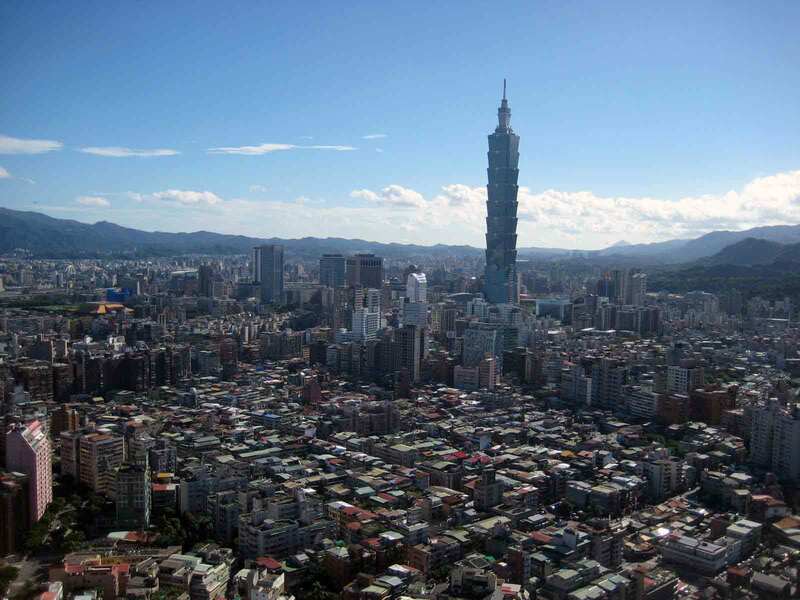 It is the second-largest supplier (after China) in construction and contracting. In 2010 the EU continued to be Turkey's main trading partner, while Turkey was the EU's seventh largest trading partner. EU countries took 46.3 per cent of Turkey's exports and provided 39.3 per cent of imports. Other important trading partners were Russia, China, the US, Iran and Iraq. A substantial economic reform program was undertaken within the scope of an IMF stand-by arrangement, following a major economic crisis in 2001 (when the economy contracted by 9.5 per cent). Successful implementation of the stand-by program accompanied by structural reforms especially in banking, the financial sector, social security and taxation saw the vulnerabilities in the economy decrease and have made the economy more attractive for foreign investment. The Turkish economy rebounded strongly from the global economic crisis. Following a contraction by 4.7 per cent in 2009, Turkey registered robust economic growth of 8.9 per cent in 2010, the fastest growing economy in Europe and third in the world in 2010. Despite strong economic gains - largely due to renewed investor interest in emerging markets, a sound banking system, tighter fiscal policy and structural reforms - the Turkish economy is still burdened by a high current account deficit and high unemployment (10.5 percent in 2011). These, with the current upward trend in inflation (8.6 percent) and the increasing foreign trade deficit, have been raising some concerns, especially of an overheating economy. As Turkey's major trading partner, the EU's ongoing economic and financial crisis is also generating some conservatism with regard to GDP growth prospects for the Turkish economy over the next few years. Energy is another problem for Turkey, which is almost entirely dependent on imports of oil and natural gas, particularly from Russia. Although manufacturing overtook agriculture in the 1980s as the major contributor to GDP, agriculture continues to play a major role in the Turkish economy, especially in employment. Agriculture accounts for around 9 per cent of GDP and 29.5 per cent of employment. There is a substantial unregistered economy, with estimates of its value ranging from 20 per cent to 50 per cent of economic activity. International business perceptions of Turkey have changed dramatically over the past few years, as global companies have come to see the country as a strategic growth market. Turkey is one of the biggest markets in the world, with a population of 74 million people, 40 percent of whom are under 22. There was steady growth in Australian exports to Turkey from mid-decade until the onset of the GFC, which saw a sharp decline in commodity exports (coal, aluminium). Two-way merchandise trade amounted to $912.3 million in 2010-11. Exports to Turkey were worth A$427.2 million, principal items being live animals, coal, medicaments, aluminium, machinery and equipment. Imports were valued at A$485.1 million, with principal items including food items, vehicles and marine craft, and clothing and fabrics. There is an increasingly strong Australian interest in the services and technology component of energy, mining, ICT, infrastructure, business services/franchising sectors as well as the historically strong showing of education services. Investment in each other's country is relatively small, although the entry into force of an Investment Protection & Promotion Agreement in 2009 and signature of a Double Taxation Agreement in 2010 are aimed at further encouraging Australian investment. A small number of Australian companies have invested in Turkey, mainly in the energy sector. Other areas of investment interest include infrastructure (brought about by government privatisation programs), mineral exploration, construction and agribusiness.